The design of an intervention logic starts with understanding both the problem to be addressed and the desired outcomes to be achieved, specifying the program logic, and building stakeholder consensus related to this theory of change. The overall objective of this application is to provide an overall representation of the derived outcomes of the Phases 1 – 5, in order for the stakeholders to better understand the rationale behind the RIS3 strategy. In order to communicate the logic of intervention, the visual representation of the intervention can take various forms. The design should help practitioners understand not only the intended outcomes of an intervention but also the inputs and activities needed to achieve them. We have chosen to design the intervention logic application as a series of blocks, describing the overall strategy flow. Each flowchart corresponds to a specific Investment Priority, and offers the user the opportunity to describe the links between the different building blocks of the intervention logic. These include: context, vision/priorities, policy mix and monitoring. Τhe user can export the results in the form of figures, or print the final intervention logic report produced by this application. Step 1. Description of the regional context. Step 2. Detection of needs and challenges that form the regional vision. Step 4. Definition of the actions and indicators to put in place to meet the priorities. Step 5. Describe the links between the building blocks of the intervention logic diagram. Step 6. Save and export the final intervention logic report. Following the application architecture described in previous steps, the information flows within the application are given in Figure 2, below. Figures including intervention logic diagrams, as well as the description corresponding to each one of them, can be extracted through the application. The main output of the application is the final report of Intervention Logic, which will give the user a comprehensive picture regarding his/her region’s strategic framework. The application gives the user the opportunity to select a specific Investment Priority and construct the corresponding intervention logic diagram. This will include information coming from different parts of the RIS3 strategic planning process, in order to present an overview regarding the results that have been obtained throughout the overall process. The steps below, illustrate some useful information regarding the proposed way in which all the needed information could be included in the final intervention logic diagram. During the first step of the application, the user will have to choose a specific Investment Priority for his analysis. The filters in this part of the application includes the selection of a specific Thematic Objective and Investment Priority (Fig. 1). Moreover, the Thematic Objectives are grouped based on the more general thematic priorities of the European Union including: smart, sustainable and inclusive growth. 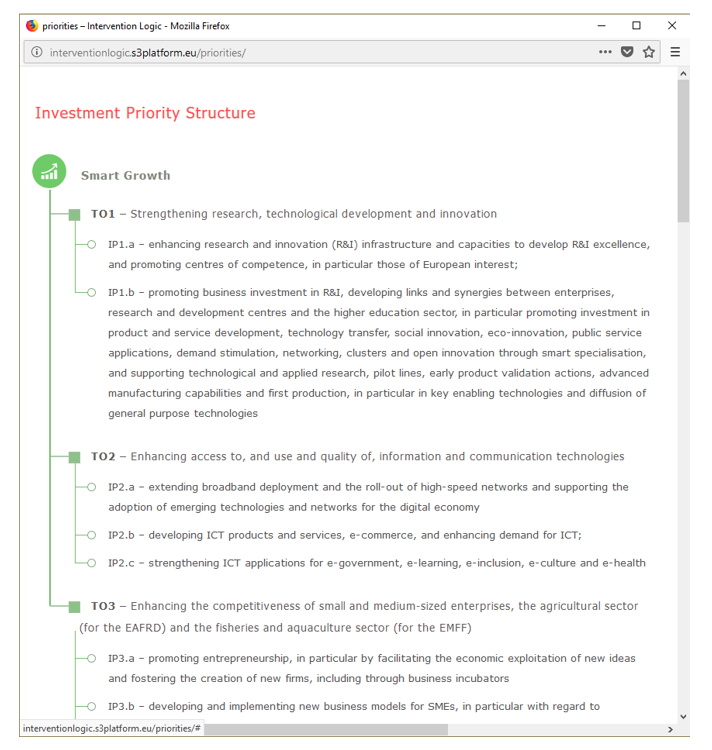 The Investment Priorities button includes the complete list of available Investment Priorities, in the form of a dendrogram, indicating also the Thematic Objectives to which they are connected (Fig. 2). Context: this part includes information coming from the analysis of the regional context, related to the specific Investment Priority. Vision / Priorities: this part included information related to the vision and priorities’ setting phases. In order to better organise the input four sub-categories have been included, related to specific methodologies that are being used in these phases. These include: EDP, extroversion analysis, related variety and foresight. Not all of them should be completed during an intervention logic design process. Policy mix: Definition of actions and action plan implementation are the two main sub-groups of the policy mix part. Both of them focus on the definition of the groups of categories of actions and regulatory instruments of intervention that could be used to support the specific Investment Priority. Monitoring: : the last part of the intervention logic diagram includes the presentation of the selected output and result indicators related to the specific Investment Priority. As it can be seen, output indicators should be related to the definition of actions, as input for them will be gathered through the implemented actions. Moreover, result indicators are related to Vision and Priorities, trying to capture the more general targets of the region, through the reinforcement of the specific Investment Priority. The Download Image button enables the user to save the block diagram in a .png format. To add new content, the user will have to insert a short description and then press the “+” button. The new item appears inside the content box of the current category. By clicking the ‘x’ button the item is automatically removed from the list of the content items (Fig. 4). Moreover, an online tutorial appears by hovering the ‘i’ icon to offer extra guidance to the user. The third step of the application offers the opportunity to describe in detail the links between the different parts of the intervention logic (Fig. 5). A set of 7 questions help the user to thoroughly describe the connections between the main building blocks of the application, and to provide a more precise description of the rationale behind the selection of the specific priorities, policy mix and monitoring indicators for the corresponding Investment Priority. By pressing the Export final report button, all text included in the description part together with the data included in the priority content section, can be exported to a .docx report for the current priority. The Save Priority button can help the users to save their progress in the current priority and include it in the list of their priorities (Fig. 6). 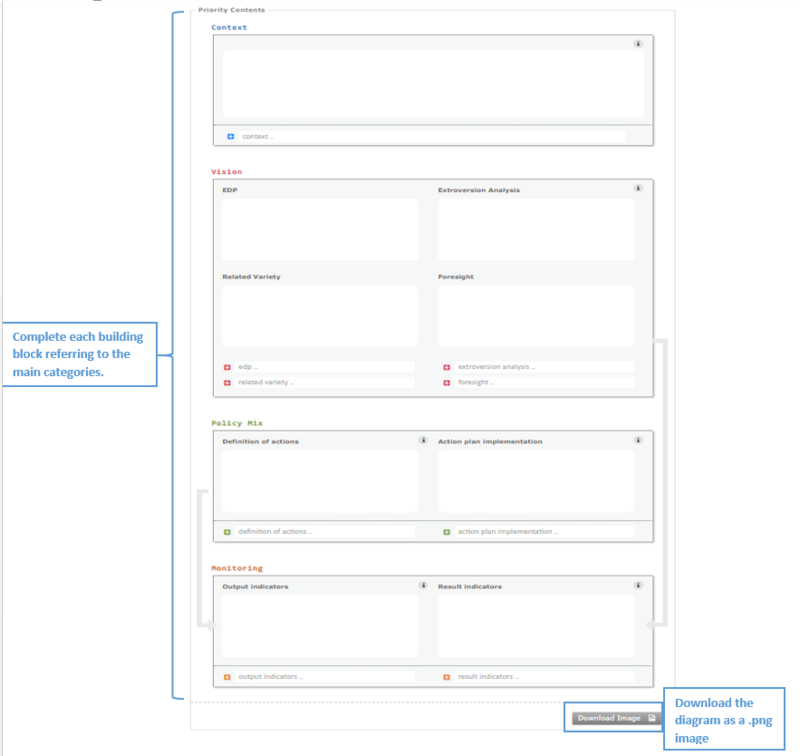 To create an intervention logic diagram for another priority, the user will have to select the “New Priority” option. Moreover, a delete option and an indication whether a .docx report has been generated for each priority are available. These functionalities are only available for the registered users of the app, as these data are stored in their personal account. The EDP focus groups application provides a content management system that facilitates the organisation of EDP group meetings. You have to sign in to save the priority. 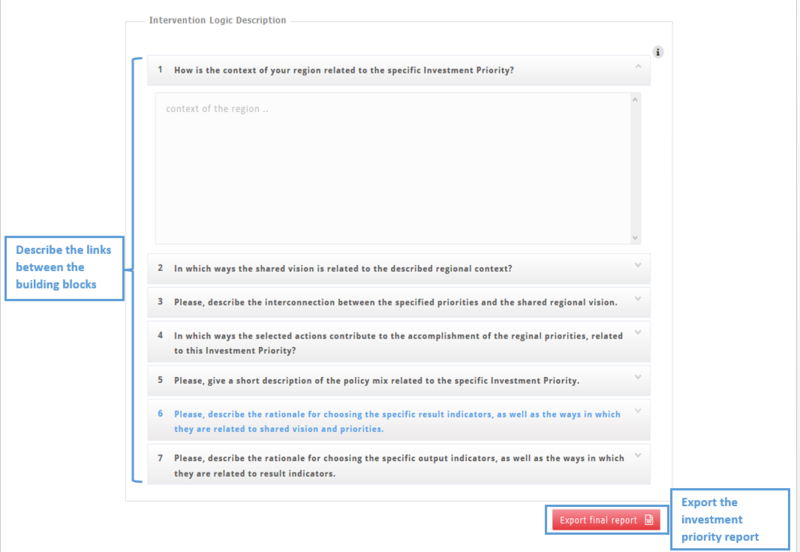 In this section, you can select your filters, in order to specify the Thematic Objective and the Investment Priority, corresponding to the intervention logic diagram that you want to implement. In this section, you can add the main outcomes from the Analysis of the Context phase, which are related to the specific Priority Axis. These may include results coming from the Mapping of the Regional Assets, Research Infrastructure Mapping, Clusters incubators and innovation ecosystem mapping, as well as Benchmarking. In the Vision section, information related to results coming from Shared Vision/Strategy formulation and Priority setting phases should be added on the diagram. The four sub-sections included here, and specifically refer to: Scenario Building, Foresight Exercises, EDP, Extroversion and Related Variety Analysis. For each one of them the user can add the most important outcomes that are related to the specific Priority Axis. The definition of actions includes the outcomes of Action Plan Co-design, Budgeting, Administrative Framework and Innovation Maps. The actions should be specified based on the need to achieve the Strategic Objectives, defined in the previous section. Categories of intervention refer to the specification of a selected number of types of intervention that will be included in the Smart Specialisation strategy, for the specific Priority Axis. These should be selected based on the Vision Statement and Strategic Objectives, that were described in the previous section. Specification of the Output Indicators that are going to be used, based on the definition of actions for this Priority Axis. Specification of the Result Indicators that are going to be used, based on the Vision statement and the selected Strategic objectives for this Priority Axis. These questions will guide you, in order to better describe the rationale behind the structure of the above intervention logic model. 1 How is the context of your region related to the specific Investment Priority? 2 In which ways the shared vision is related to the described regional context? 3 Please, describe the interconnection between the specified priorities and the shared regional vision. 4 In which ways the selected actions contribute to the accomplishment of the reginal priorities, related to this Investment Priority? 5 Please, give a short description of the policy mix related to the specific Investment Priority. 6 Please, describe the rationale for choosing the specific result indicators, as well as the ways in which they are related to shared vision and priorities. 7 Please, describe the rationale for choosing the specific output indicators, as well as the ways in which they are related to result indicators.